A NEW digital tourism information touchscreen has been installed at Cultúrlann McAdam Ó Fiaich. The hi-tech digital touchscreen, which is the tenth to be rolled out by Visit Belfast, contains instant access and information to more than 800 tourism products, including visitor attractions, accommodation, and tours. Harry Connolly, Chief Executive of Fáilte FeirsteThiar – which promotes tourism in West Belfast – said the revamped tourist service provides a positive showcase of what the heart of the Gaeltacht Quarter and surrounding areas have to offer. “The new tourist information point is a partnership between Fáilte Feirste Thiar, An Chultúrlann, Visit Belfast and Belfast City Council,” he explained. Visit Belfast Chair, Howard Hastings, added that the initiative ensures that the economic impact of tourism in Belfast is maximised at a local level right across the city. “This dynamic new digital tourism resource will deliver real benefits for locals and visitors alike, bringing them instantly up to speed with what’s happening and what’s on across the city and further afield,” he said. 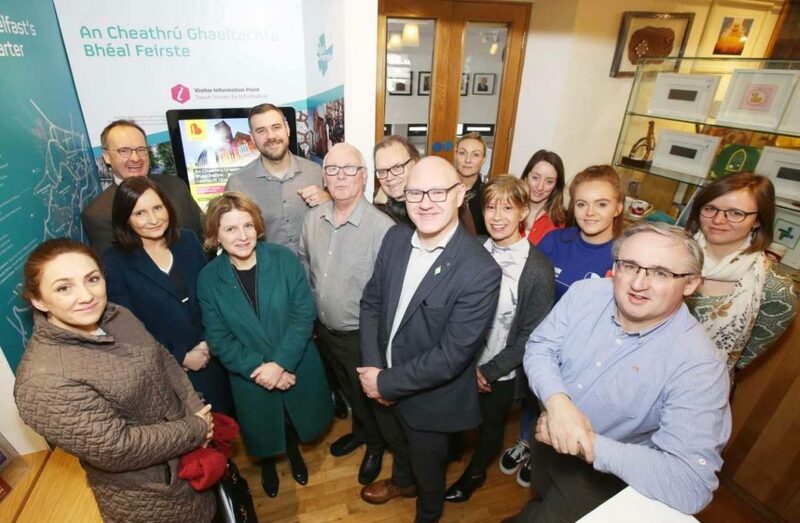 At the unveiling of the new state-of-the-art screen MP Paul Maskey said he was delighted at the partnership between the organisations resulting in a ‘great initiative’ in the heart of the Gaeltacht Quarter.